Lauren Cowley was a postdoctoral research fellow at the Harvard T.H. Chan School of Public Health. She worked with Bill Hanage in the Department on Epidemiology. Lauren joined the School of Public Health from Public Health England (PHE) where she was based from 2012-2016 while she did her PhD. The PhD was awarded from the University of Edinburgh in September 2016. The PhD was funded by PHE to investigate the molecular interactions of Escherichia coli O157 with it’s typing phages using whole genome sequencing under the supervision of Claire Jenkins, Tim Dallman and David Gally. While at PHE, Lauren became involved in the implementation of the routine use of whole genome sequencing in the surveillance and investigation of gastrointestinal bacteria in the UK by working as a bioinformatician in Tim Dallman’s group that used genomic epidemiology to monitor gastrointestinal bacteria in the UK. During her time at PHE, Lauren also became involved in the UK response to the Ebola epidemic and travelled to west Africa twice to volunteer in both the diagnostic labs and the mobile sequencing lab. 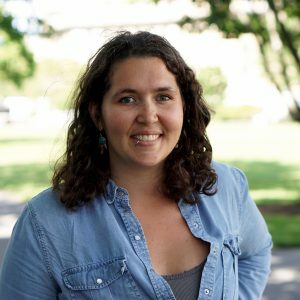 At the mobile sequencing lab, Lauren first discovered her love of nanopore sequencing technologies and was able to provide real time sequencing results to epidemiologists working in the field to track the transmission of Ebola throughout Guinea. At Harvard T.H. Chan School of Public Health, Lauren was using bioinformatics to investigate the success of certain population groups of Streptococcus pneumoniae within the context of several publicly available and CDC funded datasets. She also used sequencing data to mine the pangenome of the pneumococcus for differentiating genes, gene families or mobile elements that may play a factor in success or virulence. Lauren is a keen user of Twitter for science communication and can be found at the handle @laurencowley4. Since leaving Harvard, Lauren has started a prize fellowship at the University of Bath in the UK on Bioinformatics. She is working on machine learning techniques for classifying and typing bacteria in an epidemiologically useful fashion as well as improving sampling techniques for bacterial GWAS studies. She is also still collaborating with CCDD members, Caroline Buckee and Ayesha Mahmud on a water surveillance project at the Rohingya Refugee camps in Bangladesh using nanopore sequencing.